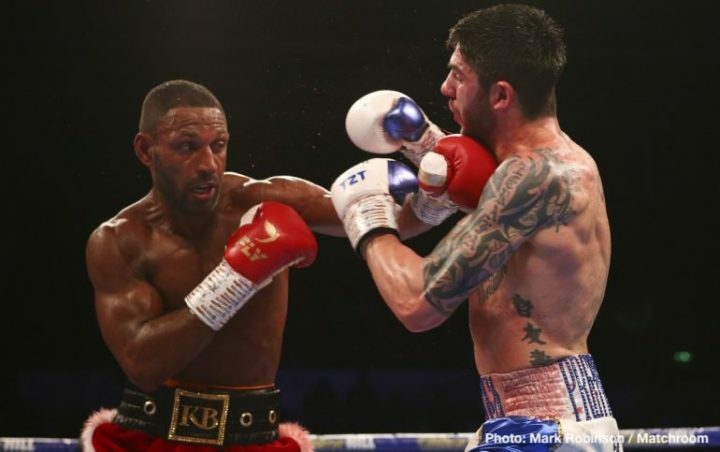 By Tim Royner: Former IBF welterweight champion Kell Brook has a couple of options in the United States for his next fight, according to his promoter Eddie Hearn. He’s not sure if the 32-year-old Brook will move down to welterweight or continue to fight at junior middleweight. Brook did not look like a world beater in his last fight at 154 against Michael Zerafa on December 8. There’s a possibility that Brook could face former WBO welterweight champion Jessie Vargas on April 6 in the U.S. Hearn isn’t confirming that Vargas is one of the two options he has for Brook to fight next in the U.S. Vargas (28-2-2, 10 KOs) is a step up for Brook from his last two fights against Michael Zerafa and Sergey Rabchenko, but he’s not what most boxing fans would consider a guy that would result in a big fight. Vargas’ record in his last four fights is 1-1-2. Vargas’ last two fights have been 12 round draws against Thomas Dulorme and Adrien Broner. Vargas was beaten by Manny Pacquiao in 2016. Brook is the WBA mandatory for WBA 154 lb champion Jarrett Hurd. However, Hearn isn’t certain whether Brook will stay at 154 or move back down to 147 to resume his career at that weight. Hearn likes Brook’s weight discipline now, and he seems to believe that he can go back down to 147 if he wants to. Hurd, 28, would be a real problem for Brook due to his size, power and youth. The way that Brook had problems with 26-year-old junior middleweight Zerafa last December, he would be at the mercy of Hurd’s size and power if he dared to accept a fight against him for his World Boxing Association junior middleweight title. Hearn signed former WBO 154 lb champion Liam Smith to a three-fight contract recently, and it’s thought that the sole reason why he signed him is so that he can put him in with Brook, and have an excuse not to match Kell against the lions at 154 like Hurd, Jermell Charlo, Tony Harrison and Erislandy Lara. Brook vs. Vargas would interest some boxing fans in the U.S. It would obviously be shown on DAZN, so the American fans would be able to watch it as part of their monthly subscription price for that platform. Apart from that, it’s not a fight that would attract a lot of interest from people in the United States. Vargas’ 1-1-2 record in his last four fights has shown pretty clearly that he’s not talented enough to be a major player at 147. For Vargas’ sake, he should move back down to 140, if he can make the weight. However, there’s money for Vargas to make fighting Brook. Hearn will obviously make it worth his while to accept the fight.